Atletico Madrid moved to within two points of LaLiga leaders Barcelona after a comfortable 3-0 win over bottom club Huesca on Saturday. Full-backs Lucas Hernandez and Santiago Arias put Atletico in control before Koke ensured Atletico extended their unbeaten run in the league to 17 games. Huesca threatened early on at El Alcoraz through the lively Cucho Hernandez, but finding a way through proved a step too far, Jan Oblak impressing once again in the Atletico goal. Lucas' first goal of the season put Atleti ahead and Arias doubled their lead before Koke sealed the points on a foggy night in northern Spain, keeping Diego Simeone's men firmly in title contention. Atleti started the better, but were lucky not to be behind in the 12th minute as Jorge Pulido's acrobatic volley beat Oblak only to thud into the post. It was a warning Atleti failed to heed and four minutes later an Enric Gallego's flick released Cucho. The Colombian forward tried to round Oblak, but the goalkeeper stayed on his feet and was able to get fingertips to the teenager's low effort. Having survived two scares, Atleti should have taken the lead moments later when Lemar latched onto Angel Correa's pass, but he fired straight at Roberto Santamaria when one-on-one. Lucas made no mistake just after the half hour, though, as he tapped home at the back post after Lemar and Koke had unlocked the Huesca defence. 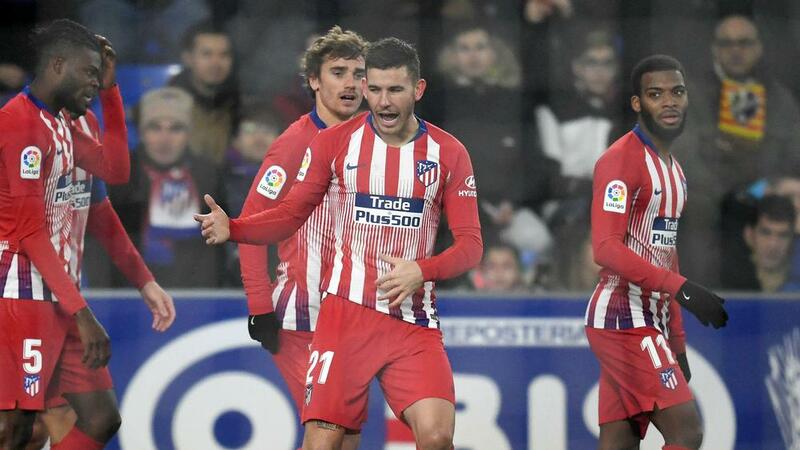 While the visibility deteriorated in the heavy fog, Atletico were not affected and almost doubled their advantage when Correa burst through, but Santamaria reacted superbly to deny the forward from point-blank range. A second goal did arrive after 52 minutes as Antoine Griezmann was given time to pick out Arias at the far post, the full-back volleying past Santamaria in style. Huesca continued to pose a threat, but their challenge was ended when Koke lashed home in the 71st minute, the midfielder finishing in style after Griezmann's header had come back off the crossbar. After their Copa del Rey exit on Wednesday, Simeone hoped his side could use it as a positive and focus on the league. Saturday's win shows they are ready to push Barca all the way and go the distance this season. Battling with Juanfran for the right-back spot at Atletico has seen Arias only start 10 league games since moving from PSV. His all-action performance on Saturday will have given Simeone plenty to think about, his first goal for the club capping off a fine display. Cucho was lively in attack for the strugglers, but his quality in the final third was lacking, the on-loan Watford forward twice failing to beat Oblak. His first attempt saw Oblak stay big, while a free header late in the first half was straight at Atletico's keeper. Atletico welcome Getafe to the Wanda Metropolitano in seven days' time as they look to keep the pressure on Barca, while Huesca travel to Real Sociedad 24 hours later.